What an interesting take on the tweed jacket and the biker jacket this piece is. Tweed jackets are usually all matronly and formal, while biker jackets are normally tough and made of leather, so it’s almost unimaginable to even think of combining them in one garment! But Katherine New York saw sense in putting the two together, and I think I’m beginning to see the light, too. Here’s what they come up with — something I’d like to describe as the love child of the tweed and biker jackets — the Katherine New York asymmetrical tweed moto jacket. 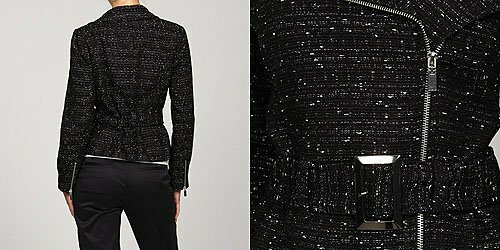 What I am loving though is the addition of that lovely silver-buckled belt and the diagonal zip front entry that lets you close it up like a true biker jacket (wish they had shown a picture of it zipped all the way up though). And don’t forget the zip cuffs; those are a must, especially on any moto-jacket-inspired piece. This jacket can easily be worn with jeans, shirts, cute little dresses, pumps, sandals, or even combat boots. I’m not too sure about wearing this jacket to a dressier or a more formal event, but if you can make it work, then hats off to you.